Since I’m not much of a drinker, I stuck to 1 cocktail and had 2 glasses of the same… the Farzi Apple Foamintini which is of course one of their signature concoctions. 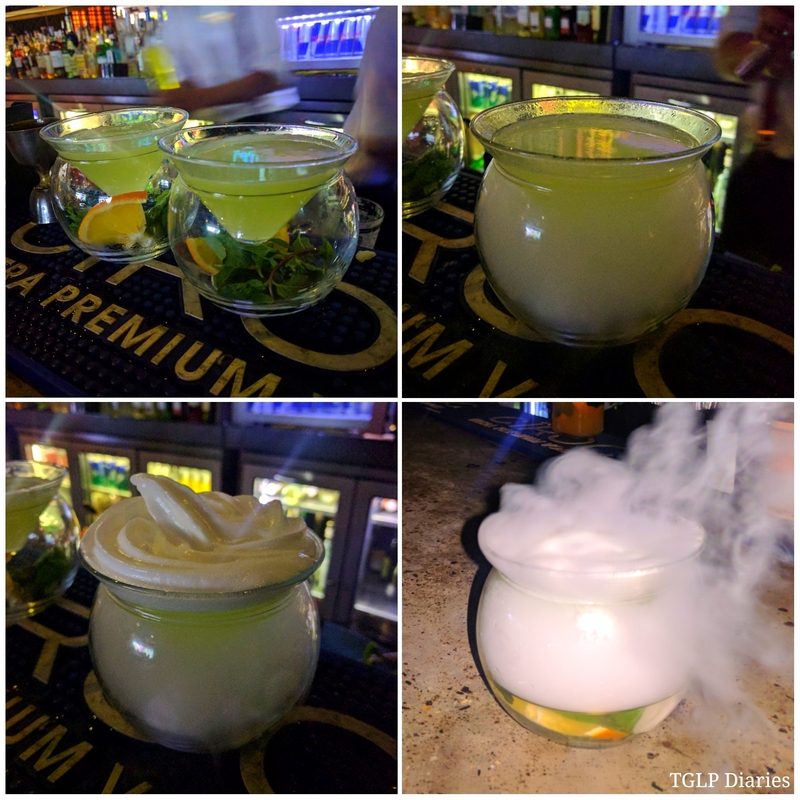 A vodka based drink, the dry ice drama is quite fascinating while the drink too lives up to the expectations one has… I’d definitely recommend it as and when you plan to dine at Farzi Cafe. 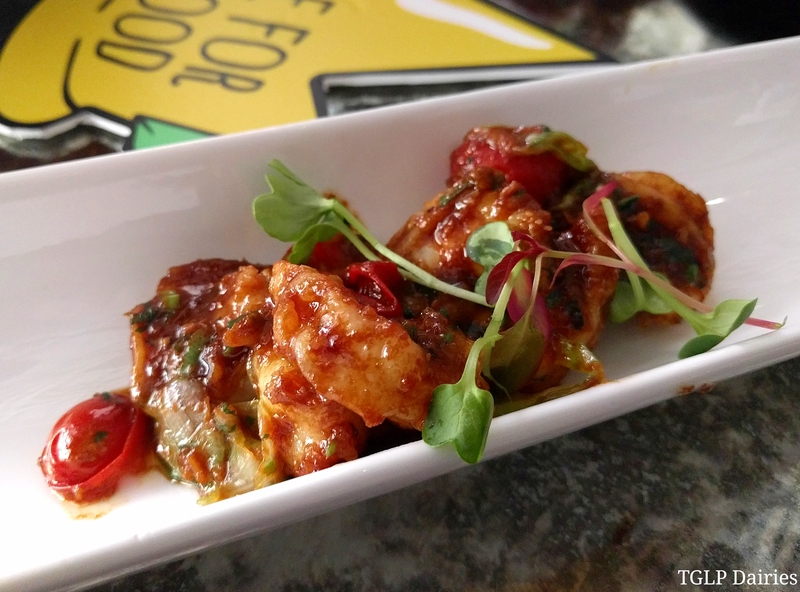 Amongst the tapas that I tasted, the Besant Nagar Chilli Fritters is basically the desi take on jalapeno cheese poppers. Resembling the famous mirchi bhajiya, it’s stuffed with just the right amount of cheese and is certainly worth giving a shot – especially if you’re a vegetarian. 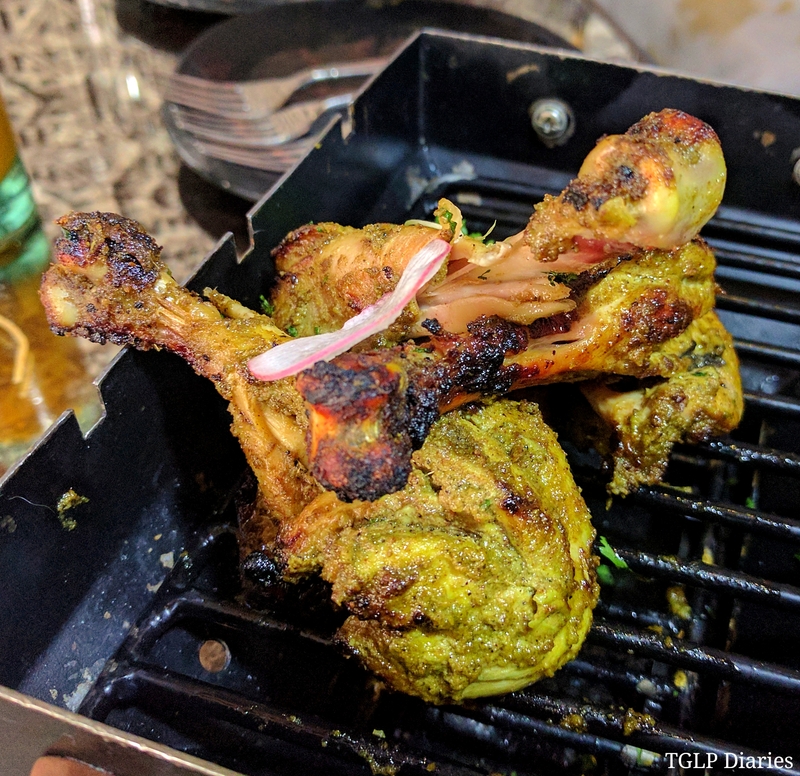 For the non-vegetarians, there’s the Dak Bungalow Chicken with Garlic Boursin where the chicken was the most tender I’ve had in the longest time. 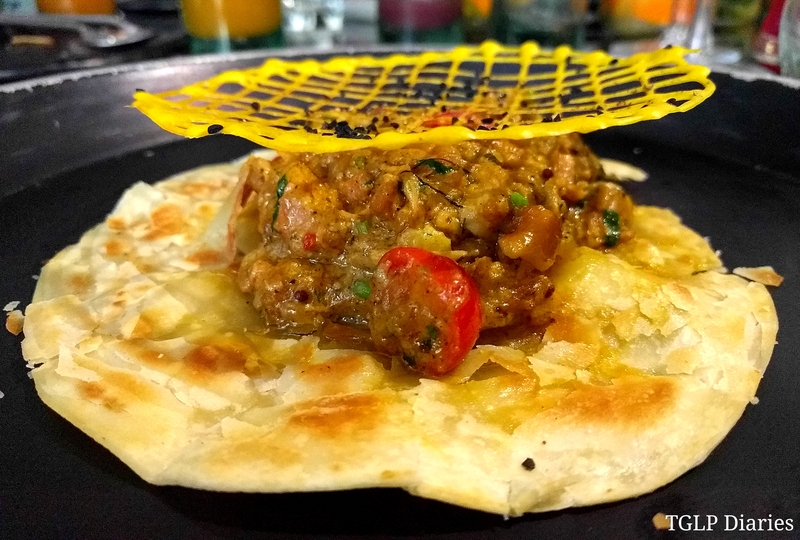 The kalmi kebab fan is bound to love this and that slightly charred flavour is definitely a highlight in my opinion. PS. extra points for the presentation. 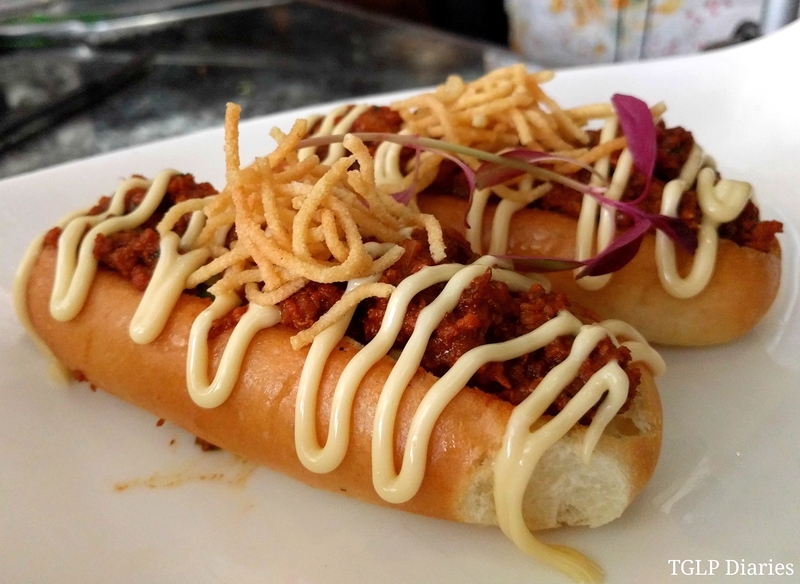 Another favourite was the Kheema Ghotala Hot Dog with onion and mint salsa. 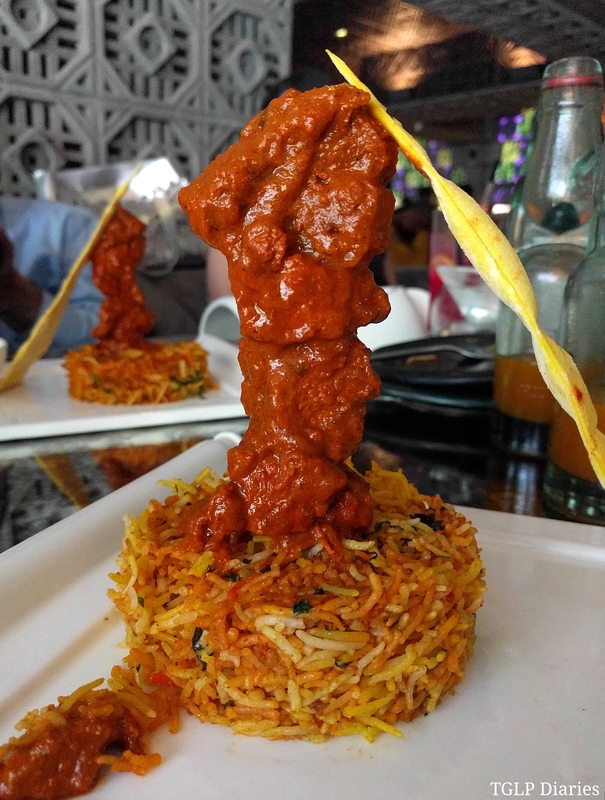 The confluence of 2 distinctive cuisine styles can be quite a treat to the taste buds. Fusion all the way, I believe this sort of preparation certainly has an audience – the kind with an open mind. Have it while the bun is still warm and the overall experience is certainly better. A shoutout to all the seafood lovers out there… prawn fans to be precise… the Black Pepper and Golden Garlic Prawns with Braised Pokchoy (eat the pokchoy with the prawns and you’ll realise what a fab combination it is) is succulently beautiful! 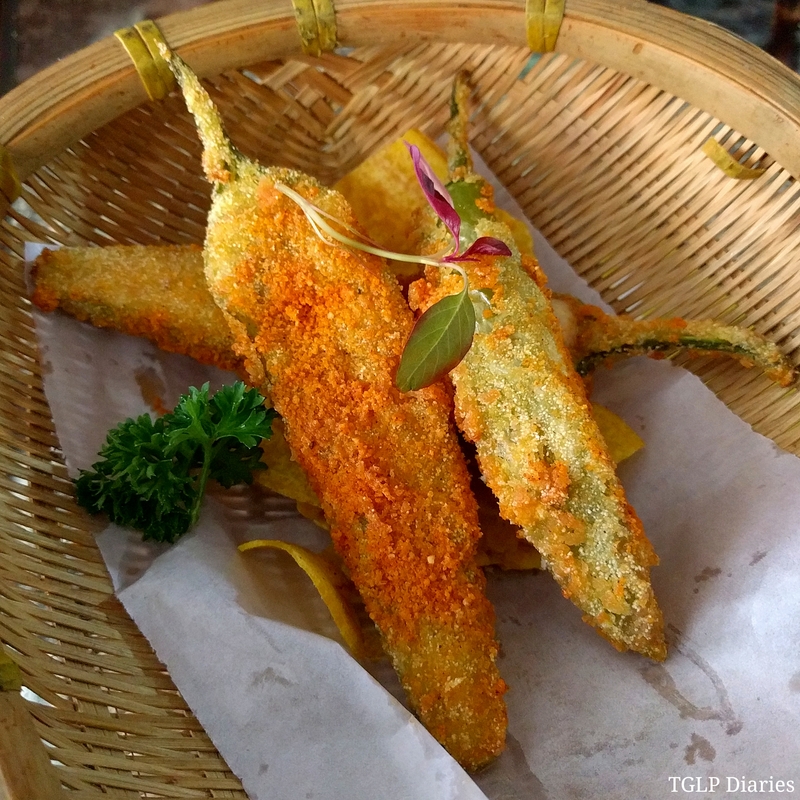 It has an easy Asian flavour that most people would enjoy. We then got a taste of the Shawarma Biryani. One of my favourites (and apparently even the chef’s) from this afternoon, I love how they present it and when it tastes even better, you know you have a winner. Although not exactly a shawarma-like flavour, the lamb meat was well cooked, the rice was flavourful by itself and when the 2 come together, it’s hard not to love this combination. 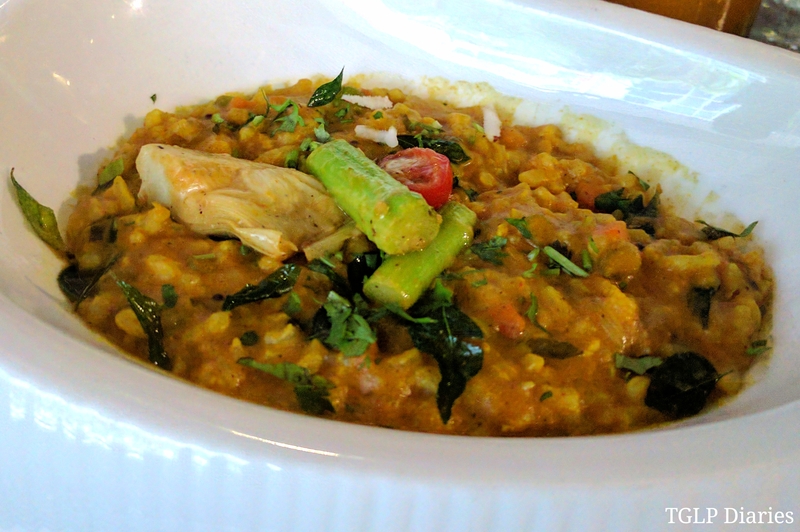 To all the vegetarians out there, I don’t believe you should be left out, so when they served us some Bisi Bele Bhaat (with charred artichokes and cherry tomatoes) the South Indian in me was intrigued… For those who aren’t aware, it’s like the dal khichdi of South India… a wholesome and very homely preparation that is meant to be savoured on days you seek soul food. Personally, I’ve had better but then for those who have nothing to compare it with, it’s a good bet. Last of the many new additions to their fanciful menu, I tried the Hand Pulled Pork ‘Kootan’ with Fried Cashews. Now this is something I’ve never tasted before… where virginal flavours took over and I was most definitely enjoying every bit of it. Don’t be conscious to get your hands dirty as there’s another sort of joy in eating dishes like these with your hands. The pork was extraordinary – cooking style as well as taste wise and I’d want to go back for more. Now that we were done tasting so many new offerings, it was time to try out the 2 desserts. 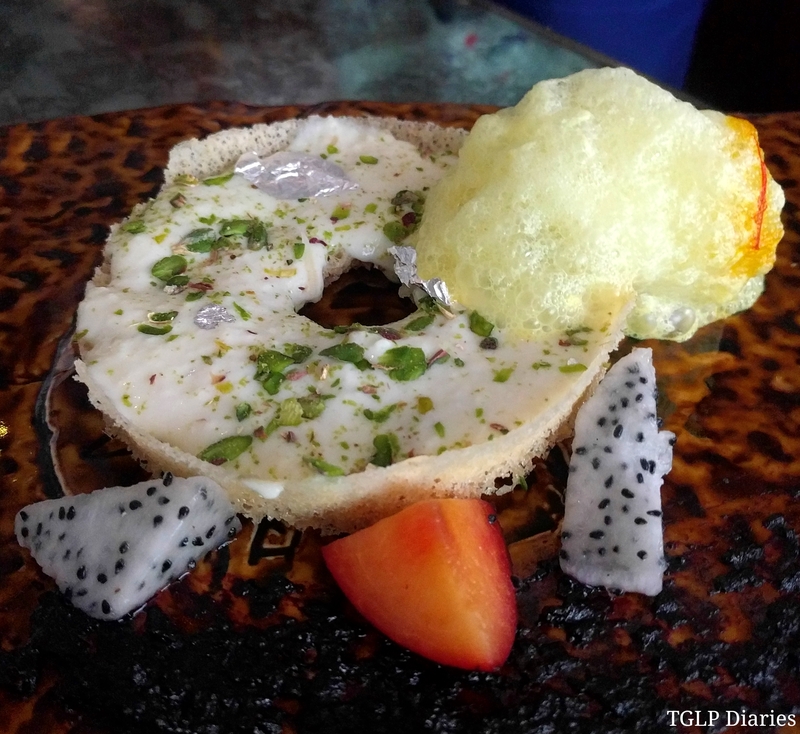 the Ghevar Malai Tart with Saffron Aire looked like modern art on a plate. It’s where you also notice how fusion food finds a whole new meaning. Personally, I’ve never been big on Indian sweets, so it didn’t do much for me… but I am pretty sure this sweet treat is capable of building an audience of its own. 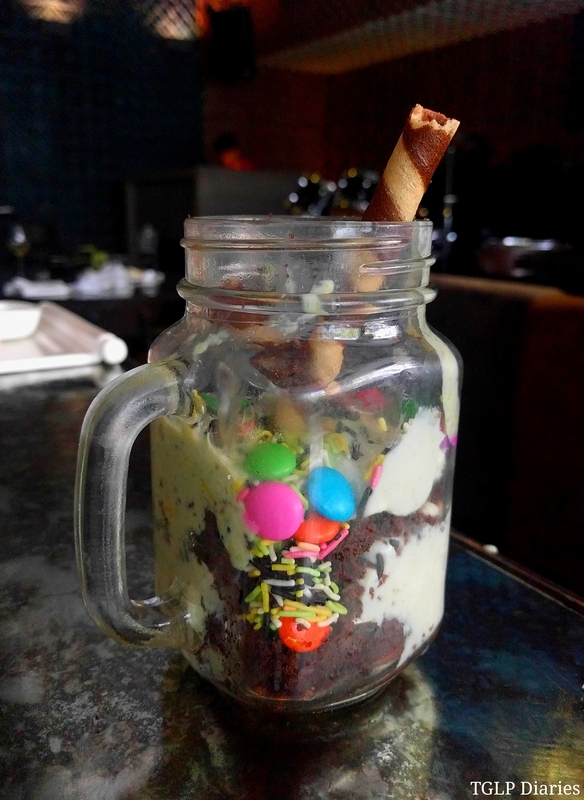 The Farzi Sundae which consists of Pistachio Blueberry and Brownie (quite a combo, right?) again, lacked that wow factor despite a description that sounded promising… I think the mish-mash of too many elements coming together can be a dish dampener. Nevertheless, it’s a personal opinion and I’d love to learn about different experiences from various perspectives from the people who do give it a shot.